We’re halfway through the Sochi winter Olympics and the athletes aren’t the only ones engaged in competition. Brands are also jockeying to see which social media strategy is the biggest success during this global event. According to social analytics firm Engagor, Visa seems to be the social media winner so far with the most used hashtags and nearly 30,000 mentions. While the general sentiment of the engagement is fairly neutral, some people aren’t too happy about the spoilers coming through their Twitter feeds. With more than 14,000 mentions, McDonald’s is the runner-up. Unfortunately, 30 percent of these mentions are negative, giving McDonald’s the highest overall negative sentiment on social media. On the other side of the spectrum is the consumer goods giant P&G with the highest overall positive sentiment. Despite the high volume of mentions for Visa and McDonald’s, Coca Cola is most engaged with fans and responded nearly 400 times to audience posts. This kind of engagement helps the brand create an authentic relationship with their fans, an Engagor spokesperson said via email. And while it might be hard to face the firing squad, according to Engagor, brands should always respond to negative comments. Ignoring negative posts could result in a snowball effect, and one negative comment could quickly turn into hundreds or thousands. Companies should also get to the root of what’s driving the negative sentiment and learn from it. 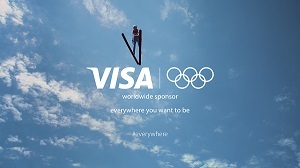 Ultimately, Visa is leading the way in social mentions because the company stays on message and understands its fans. “The company is making a conscious effort to make sure their social media posts reflect not only their own brand and values, but those of the athletes, sports and Olympic events as well,” Engagor said.